Nerite Snail White Spot On Tip Of Shell? Discussion in 'Snails' started by jfer76, Apr 17, 2017. 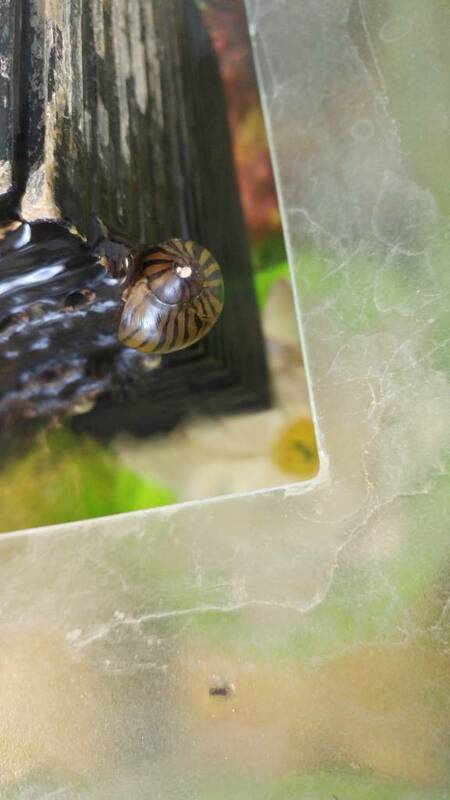 First post, sorry if this has been covered, but I couldn't find anything... My nerite snail, Nero, has formed this white spot at the tip of her shell. What is it? I keep a piece of cuttlebone in the tank for her. Thanks for any help! Don't worry. Normal. All of mine have that. Mine do as well never gave it thought. The enamel protecting the shell has been lost, probably from mechanical damage. The shell (and therefore the snail) lasts longer when it is fully protected. I have one which is 11 years old pictured here. Actually make that only 1 of my 3 have that I just checked for my own curiosity. An 11, ELEVEN year old Nerite? You should call Guiness! I think the oldest on record is 2. Yours has this beat by a mile. The shell (and therefore the snail) lasts longer when it is fully protected. Can this hurt her? I'm not sure how this would have happened... Is there anything I should do for it? Thank you. I'm glad it is nothing to worry about. She didn't have it when I got her, so I wanted to be sure.